C’mon Macarthur United: The prospect of regular A-League action at Campbelltown Sports Stadium just became a step closer. The United for Macarthur A-League bid is one of three from Sydney which have made it to the next stage after the 15 bids for an A-League licence were culled to a short list of 10. Football Federation Australia (FFA) has today invited the 10 remaining bidders to take part in the next stage of a process to expand the Hyundai A-League. FFA intends to grant licences for two new clubs to join the Hyundai A-League in the season after next, 2019-20. Campbelltown Council, which is behind the United for Macarthur A-League bid, says it has now passed a major milestone in its campaign for one of the two expansion licences. Mayor of Campbelltown, Cr George Brticevic, welcomed today’s announcement of the short list by the FFA. “Council has led the preparation of the United for Macarthur A-League bid, on behalf of the region. “The United for Macarthur bid has achieved bipartisan support from all Federal and State members of Parliament within our region and strong support from both Camden and Wollondilly Councils. “I would like to thank to all those who have supported the United for Macarthur Bid in particular Macarthur Football Association, our business community, broader sports community and the many residents who have registered their support through the website. “Special thanks have to go to our sporting ambassador Brett Emerton, community ambassador Kaarle McCulloch and business ambassador Lang Walker,’’ Cr Brticevic said. Our A-League licence bid has now gone into a short list of 10, one of three in the Sydney metropolitan area. The 15 formal submissions received at the end of the initial Expressions of Interest (EOI) stage were analysed by FFA and its lead advisers Deloitte against the criteria contained in the EOI documents with additional information sought from all parties. The next bid phase will commence in July and provides invited parties access to a data room containing a range of Hyundai A-League related information and the ability to ask additional questions and engage with FFA and Deloitte. Final binding bids are due by August 31 and the announcement of the new licences is planned to be made by October 31. FFA Chief Executive David Gallop said the process remained highly competitive. 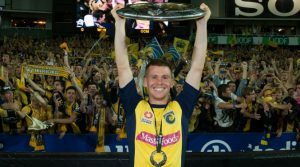 “FFA’s job is to get the best outcome for the Hyundai A-League and football as a whole,” he said. “That means granting licences that will complement the existing Hyundai A-League clubs, link back into fans and the football history in their local community, help to develop football pathways for more players, increase interest from sponsors and broadcasters, have solid financial backing and operate sustainably. “Expansion has created enormous interest and attracted 15 groups to come forward from around the country. FFA has advised the unsuccessful parties that it intends to expand the Hyundai A-League further in future years and encourages them to bid for licences at that time. Macarthur region football fans can find out more, or register their support by visiting unitedformacarthur.com.au, or join in on the #U4M conversations on Facebook.